If you are mad about tattoos then instead of making your body a live-tattoo exhibition , how about carrying tattooed phone that would add to your style and would be just an extension of your passion! Motorola has introduced its ultra-slim phone in “tattooed” versions just-in-time for Christmas. 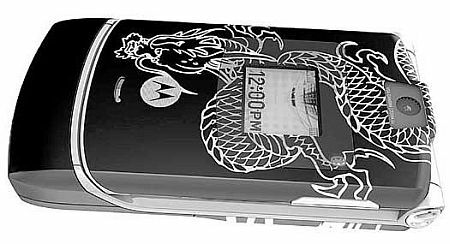 The New Razr features beautiful Chinese tattoos etched onto it. The Motorola Razr clamshell features designs by the master tattoo artist Ami James of the hit TV show “Miami Ink.” Motorola displayed the first of the tattooed designs featuring a dragon, but the upcoming models will feature most popular tattoo designs including butterflies, stars, tribal patterns, crosses and fairies. SunTimes reports, ‘Motorola converts James’ images to a digital format, and using computer-assisted design, etches them on the high-grade aluminum phone bodies.’ No information on the price and availability is disclosed yet, but, we will keep you posted! Flummoxing London's Tower Bridge made with matchsticks!